Need an affordable solution to the dew problem? It's the season where dew is making itself more prevalent and we have a way to keep it from disturbing your telescopes! Edited by OpticalStructures, 22 January 2019 - 07:39 PM. Have 1 and it worked. The 1st time I used it, my corrector plate didn't dew up immediately like usual. With the dew shield it took about 15 minutes instead. If you live in PA and have an SCT, better invest in a dew heaters... or just get a newt. 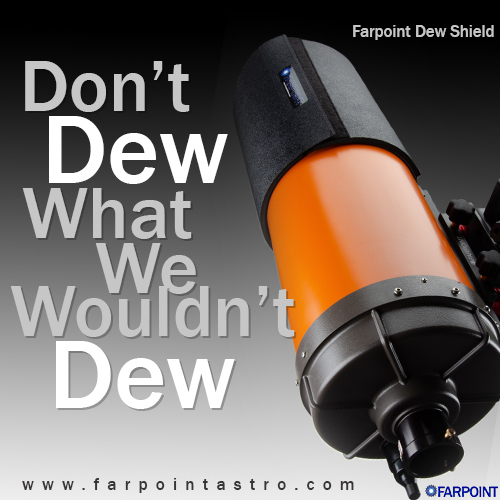 The farpoint dew shield is a nice product though. I defected from cloudy PA to southern CA forty-five years ago. Where I live now, it's arid enough that dew rarely becomes a nuisance before 2 or 3am... and even then, it's not really a problem, unless I'm using my trusty old C8. I got a Farpoint dew shield for it last year, and the problem is gone forever. It's also terrific for blocking ambient streetlights and porch lights. I keep the shield "Velcroed" together in a large plastic shopping bag, so it's always ready when I need it. Slips right on, stays on, slips right off. After moving from humid Florida to dry New Mexico I still use my dew shield especially at outreach events. It helps block stray light from street lights and it keeps little fingers from touching the corrector glass.